Samoan artist Yuki Kiharas’ exhibition A Study of a Savage is a thought-provoking and subversive depiction of colonial exploration, expansion, and racism - historically and nowadays. Utilising the mediums of photography and moving imagery Kihara transports anthropological discussions into the present by linking colonial mindsets of racism into the world of sport today. In the late nineteenth century photography and black and white film were crucial to colonist research of ‘primitive peoples’ with whom they came into contact, as they spread their empires across the globe. The science of anthropometry developed to study human diversity. Anthropologists and amateur researchers collected data to promulgate scientific theories of a racial hierarchy, (brawn verses brain; permissiveness versus virtue) and the enduring myth of Aryan superiority and Eugenics. ‘Savage’ subjects were poked, prodded, measured and photographed to position them on the evolutionary scale somewhere between the primate and present day man. In the historical footage subjects were stripped of their apparel and their dignity and photographed in stark scientific settings or in alluring sexualised settings with equally scientific or ‘saucy’ titles. Such objectification placed the savage lower on the evolutionary scale, they were animal-like, powerless, simple peoples and sexualised for the pleasure of the viewer. The depiction of Samoan ‘savages’ historically continues today with the same objectification being highlighted in the international and regional sporting worlds. Kihara used anthropological classification to define human types in this case the measurement and movement of the savage male to depict finely tuned human machine. 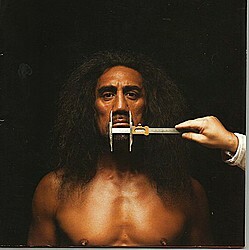 Kiharas’ large format photographs and life-size video projections imitate the historical and ongoing fetishizing of Samoan (native/savage) men. Kihara creates a character for this series – the persona of Maui is fellow artist John Ioane. In both photograph and video every part of his body is open to the photographers and viewers gaze. Kiharas’ Maui is unquestionably no passive submissive specimen, no shrinking violet. Maui taunts the camera, mocks the viewer with his dominating and relentless stare. He is naked, brown, proud and self-aware. This Maui is challenging the colonial historical critique and contemporary classification of the brown, savage as an underdog. Kihara references the works of Louis Sullivan, Graham Balfour and Franz Boas (teacher of Margaret Mead). Boas used callipers to measure subjects. Balfour stopped off in Samoa to visit his cousin Robert Louis Stevenson where he recorded measurements of arms, waists, thighs, and ‘other bodily parts’. Such intimate recordings were justified as ‘native peoples’ were viewed as part of their imperial empire, along with science, technology and religion, which the colonial powers saw as their right to spread across the globe. Kiharas’ photographs and installation film captures centuries of representations of the savage male over the colonial period – to the present day. Perceptions have to some degree stood still and the Samoan/Polynesian male body continues to be objectified, measured, and scrutinised today as it was in the late nineteenth century. Colonial and contemporary narratives continue to be imbued with stories on class, race, hierarchy tensions, social class and thoughts of superiority. Reference: A Study of a Samoan Savage essays by Mandy Treagus & Fa’anofo Lisaclaire Uperesa.